Self-determination means having the freedom to be in charge of your own life, choosing where you live, who you spend time with, and what you do. It means having the resources you need to create a good life and to make responsible decisions. It also means choosing where, when, and how you get help for any problems you might have. Express Yourself! 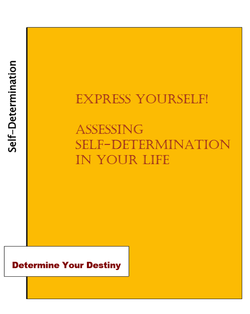 Assessing Self-Determination in Your Life is a self-assessment tool designed to help people discover how much self-determination they have in different life areas. It helps users identify those areas where they’d like to increase their level of self-determination, and other areas in which they’re already satisfied. As they complete the assessment, users become more aware of what self-determination is and how its presence or absence affects their lives. They then are offered links to web sites they can access in order to increase self-determination in that area. For example, a person desiring more self-determination in the area of transportation is directed to a web site that shows them how to use local public bus, train, and elevated transit systems. This assessment is for people who have a mental illness or who have found it hard to do certain things in life because of mental health or related issues. Other people have found the self-assessment to be useful as well, including people facing important life challenges and developmental transitions such as graduating from high school or college, undergoing separation or divorce, or preparing for release from jail or prison. Many people with emotional problems are unaware of what self-determination is and its important role in building a satisfying and productive life. They may not believe that self-determination is possible for them, due to facing stigma and discrimination. If this describes you or the people you work with or care about, then this self-assessment may be useful. It can help people start believing that they can control their own destiny, regardless of whatever challenges they face. They discover that small steps toward reclaiming their lives can lead to bigger changes that help them achieve their dreams. ​Express Yourself! is a self-guided assessment, but it also has been used by clients working together with their service providers, and by groups of people in peer-run behavioral health programs, community mental health centers, inpatient units, forensic settings, and high schools. It can be used anywhere that a person or a group wants to learn more about self-determination and how to increase it in their lives, based on their readiness to make changes. The assessment includes statements about specific life areas such as “I choose where I work” or “My basic human rights are respected.” Users read each statement and think about whether it describes their life. If it does, they skip it and go on to the next one, continuing until they reach a statement that isn’t true for them. After putting a check mark next to that statement, they move on until they’ve read and thought about each one. Next, they put a second check next to life areas that are important to them. Once the assessment is completed, users are encouraged to think about and share the results with others, especially regarding those life areas they checked twice. If they are ready to start making plans to increase self-determination in areas that matter to them, they can go on to access web sites specific to those areas. They also are encouraged to review and use another Solutions Suite tool entitled, This is Your Life! Creating Your Self-Directed Life Plan, which guides them through a goal setting and life planning process. The self-assessment is 11 pages long and can be completed online or downloaded and printed for use. The online version includes live links to the aforementioned web sites. Users of the paper-and-pencil version can type the web site addresses into their browsers. It is written at a grade school reading level. No experience is needed to use the assessment. 1. Read the whole assessment tool before completing it. 2. If using the assessment on your own, consider involving at least one person who will support you in this process. 3. Feel free to put the assessment aside and pick it up later if it becomes overwhelming or too difficult. 4. After completing the first part and identifying life areas for change, give yourself a break before moving on to access the recommended web sites or using the planning guide, This is Your Life! Creating Your Self-Directed Life Plan. 5. Talk with your providers (both peer and traditional) about how the assessment results fit with your treatment plan and other goals. 6. Recognize that understanding and enhancing your self-determination is a process, not a one-time event. There may be starts and stops along the way.